You can add as many files as you wish to a conversation. 1. Start a new conversation. 2. Below the text field you’ll see three icons. 3. If you wish to add an image, click the camera icon. If you want to add a video click the video icon. If you wish to add another filetype, ie. a Word doc or a PDF, click the paperclip icon. 4. A drop-down window will appear showing the files on your computer. 5. 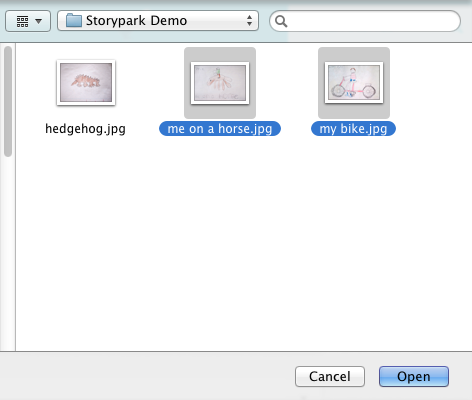 Find the file you want to add (it’s a good idea to keep the files you want to add to Storypark in one or two places so they’re easy to find), click the file and then the ‘Open’ button. 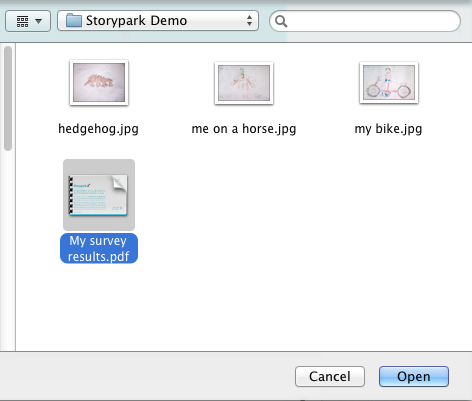 If you wish, you can change the name of your file in the text field. 6. When your file has finished loading, you’ll be able to click 'Post'. 1. Hold down the 'Ctrl' key (on a PC) or the 'Command' key (on a Mac) and select another file. Both will show as being selected. 2. You can continue doing this until you have finished selecting all the files you wish to upload. 3. Click 'Open'. All your files should begin uploading to the reflection. If you have selected a lot of large files they may take a while to upload depending on your internet speed, but you can continue writing your conversation while you wait. 5. When all your files have finished loading, you’ll be able to click 'Post'.